In the wake of the brutal murder of two French journalists in Northern Mali, the European Commission, UN and World Bank pledged on Monday (4 November) to increase its financial assistance for the Sahel. European Commissioner for Development Andris Piebalgs joined UN Secretary General Ban Ki-Moon and World Bank President Jim Kong Kim on Monday (4 November) on a visit to Mali’s capital, Bamako, where they pledged some $8 billion (€5 billion) to contribute to the region's stability. On Tuesday (5 November), all three will visit the Northern city of Timbuktu, where security forces have been deployed. For its part, the French Foreign Ministry announced it would send 150 additional soldiers to the Kidal region, in the southern part of the country. The region is still under shock after the double execution of the two journalists, which happened only a few days after the release of three hostages, held captive for three years. Claude Verlon and Ghislaine Dupont were kidnapped and executed on 2 November in Mali, where they were working on a report for RFI, the French speaking international public broadcaster. France's military intervention in Mali last winter, successfully pushed back the Islamist rebels that were threatening to take over the country. There are still around 1500 French soldiers in the area, under the “Serval” operation. In addition, the UN has deployed a peace-keeping mission, Minusma, to maintain security. Despite the consistent international presence, terrorist actions cannot be fully prevented and the situation is especially unstable in the north, as well as along the border with Algeria. 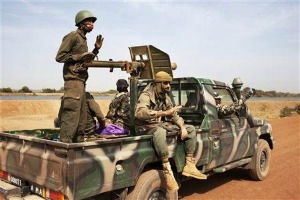 The journalists were kidnapped in Kidal, where 500 international soldiers are stationed. According to the French foreign ministry, the assassins were members of the Aqmi organisation, which stands for Al Qaeda in Maghreb. “They were coldly assassinated by terrorists,” the official press release read. The rumour of a ransom, most likely paid by the employers of the former hostages – the French companies Vinci and Areva -, is believed to have created tension amongst the different armed groups. The European Commission will allocate specific funds to help tackle instability in the Sahel. Most of the money will come under the European Development Fund, €3.9 billion between 2014 and 2020. Other regional instruments should help mobilise an additional €1.15 billion. This strategy is built on the conviction that development and security are inter-connected and that the Sahel's complexity means that it requires multiple responses. Between 2007 and 2013, the Commission allocated €827 million to the region, which is significantly less than what is foreseen for the next period, from 2014 to 2020. However, the funds were only released in October 2012, the last year of the budget period. “It’s not the region that gets the most help from the EU, but it is a political priority,” a Commission spokesperson said. The Commission made the announcement as part of a joint action between the UN, the World Bank, the African Development Bank and the African Union, grouped under the banner 'Sahel – AGIR Initiative'. Mauritania, Chad, Niger, Senegal and Burkina Faso – the five countries of the Sahel region – should all receive assistance in the coming years. Mali, a nation of 16 million, erupted in conflict in early 2012 when army officers deposed the civilian government while Tuareg fighters who had been sheltering in Muammar Gaddafi’s Libya returned home to renew their long-time rebellion. Civilian rule was restored, paving the way for the restoration of EU and international aid this year. French intervention has stabilised the south and the influx of aid. has allowed relief organisations to begin restoring war-damaged clinics in populated northern areas despite continuing threats of rebel attacks. The UN’s humanitarian agency reported on 8 May that 475,000 people had fled northern regions due to conflict and food insecurity. The International Committee for Red Cross says civilians continue to stay away. Many refugees have fled to neighbouring country's in West Africa's Sahel region. The Kidal region is in northen Mali. Translation issue here. Also a typo: 3.9 billion – not million – will come under the European Development Fund.